This 1615 square foot single family home has 4 bedrooms and 2.0 bathrooms. It is located at 2079 Curry Rd Schenectady, New York. This home is in the Mohonasen-Draper (Rotterdam) School District. Nice ranch in woodlawn with most of the work already done. It has a newer roof with a fenced in yard and a over sized shed. This house is close to everything shopping, highway and restaurants are a 3 minute drive. Also close to the bus line. Property needs everything. Photos below. Cash or rehab loans only please. Will not pass conventional or regular FHA or VA funding. Great house close to everything! This property was foreclosed and now the lender is selling it for $31,900. Zillow’s Foreclosure Estimate predicts this property will sell for $85,929. SEPT 22 2015 Foreclosed $36,200 The lender, BAYVIEW LOAN SERVICING LLC, assumed this property for $36,200 during foreclosure proceedings and now owns it. MAY 11 2015 Foreclosure auction $101,898 unpaid balance Public records data shows the owner of this property has been served a Notice of Sale, and a foreclosure auction occurred on 05/11/15. Home in default Public records indicate the owner of this property is in pre-foreclosure. Loan issued A loan was issued by BAYVIEW LOAN SERVICING LLC. Great opportunity located close the village of Ravena and right next to 9w. NOV 10 2015 Foreclosed THE lender, U S BANK NATIONAL ASSOCIATION, assumed this property during foreclosure proceedings and now owns it. SEPT 29 2015 Foreclosure auction $157,411 unpaid balance Public records data shows the owner of this property has been served a Notice of Sale, and a foreclosure auction occurred on 09/29/15. Loan issued A loan was issued by U S BANK NATIONAL ASSOCIATION. JAN 16 2008 Previous sale $121,900 The property was sold for $121,900. Loans” from Moody’s Investors Service. The credit ratings agency released research Tuesday that suggested the rates would persist well into 2017. Moody’s researchers chalked up the high rental demand to historically low rates of homeownership, steady household formations, and lingering consequences from the foreclosures and bankruptcies of the Great Recession. Rental demand is essential to stability, with borrowers in financial trouble often resorting to renting out their properties to supplement income. “Owner-occupied loans experienced lower default rates during the 2007-09 downturn because owner-occupied borrowers had stronger incentives to keep current on their mortgages,” the researchers added. Even so, the losses for pre-crisis investor loans and owner-occupied property loans came to about the same, according to the researchers. This was because the severity and modification rates for defaults in investor loans surpassed those for owner-occupied property loans. Default rates also tended to rise or fall in accordance with FICO scores. 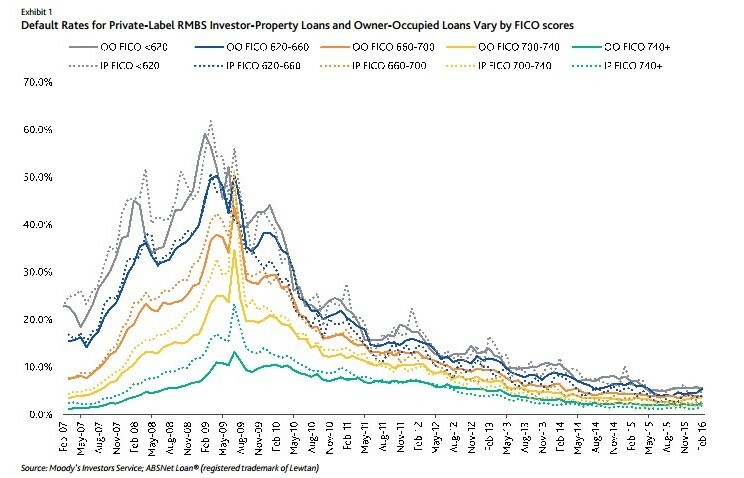 Investor property loans with scores less than 620 had a higher probability of defaulting than those with scores on the upper end, although these rates have come down significantly from their historic highs over the last half decade and stabilized in February. For seriously delinquent, underwater homeowners struggling through the murky aftermath of the financial crisis, help is on the way in the form of a gift from the Federal Housing Finance Agency (FHFA). According to an announcement from the FHFA,Fannie Mae and Freddie Mac will soon be required to offer principal reduction to certain seriously delinquent, underwater borrowers that are grappling with the after effects of the crisis. The new offering, or the Principal Reduction Modification program, is designed to help struggling homeowners avoid foreclosure and stay in their homes, the FHFA stated. The modification program was approved under FHFA’s statutory authority in the Emergency Economic Stabilization Act of 2008 “to implement a plan that seeks to maximize assistance for homeowners and … minimize foreclosures,” including through a “reduction in loan principal,” while minimizing losses for the Enterprises as well as other provisions of law. Eligible borrowers must have loans that are owned or guaranteed by Fannie Mae or Freddie Mac and meet specific eligibility criteria, the announcement noted. However, there is one concern that the program does not address directly: What will happen if borrowers begin to default purposely on their mortgage in order to qualify for the program? To address the issue of borrowers defaulting on purpose, the FHFA outlined several eligibility criteria to qualify for the program. The modification will be available to owner-occupant borrowers who are 90 days or more delinquent as of March 1, 2016, whose mortgages have an outstanding unpaid principal balance of $250,000 or less, and whose mark-to-market loan-to-value ratios exceed 115 percent. The FHFA identifies more eligibility criteria in the fact sheet released with the announcement. Approximately 33,000 borrowers will be eligible for a Principal Reduction Modification, the FHFA estimates. In addition, servicers must find and present borrowers eligible for a Principal Reduction Modification by October 15, 2016. The recent changes announced today by the FHFA will likely reel in some scrutiny from the both the industry and consumers, according to Watt. In addition to the Principal Reduction Modification program, the FHFA also announced today that it has approved further enhancements to its requirements for Freddie Mac and Fannie Mae’s sales of non-performing loans (NPLs). Establish more specific proprietary loan modification standards for NPL buyers. This home is in the Troy School District. OCT 9 2014 Home in default The owner of this property has been served aNotice of Lis Pendens. Tian Liu is the Chief Economist at Genworth Mortgage Insurance, responsible for tracking U.S. and regional economic trends. He also authors the company’s Weekly Economic Report, and provides regular updates on U.S. and regional economies, as well as the housing and mortgage market. 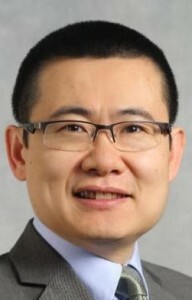 Liu began his economics career in the Australian Treasury Department in 1997. He started covering the U.S. housing market with Cemex in 2007, where he was the Director of Economics responsible for economics and housing market analysis supporting the senior management of Cemex U.S. operations. He was hired by Owens Corning to lead its economics team in 2011. Liu joined Genworth Mortgage Insurance as its Chief Economist in 2014. He recently spoke with DS News about what is in store for the housing industry for the remainder of 2016. We’ve heard predictions both ways on what the housing market will look like for the rest of 2016: On one hand, some say the tight inventory combined with home price appreciation and slow wage growth will hamper affordability. Others are forecasting improvements in inventory and wage growth that will lead to a more robust housing market. What do you think home buying will look like for the rest of this year? That’s a very good question. You’re actually asking it at the right time because I think we are about to get into the spring selling season. So it’s a very important time in the year for the housing market. In terms of what we are seeing, let me start at the macro level. At that level, we are seeing very strong employment levels for the U.S. Basically, we are at full employment. The unemployment rate is about 5 percent. U.S consumers are in really good shape—you have wage growth picking up, you have lower, cheaper gas prices, and a low interest rate going into the home buying season. In addition to that, you have a very strong U.S. dollar, which means if you are buying imports, the cost of the import in terms of U.S. dollars is actually down about 15 or 16 percent in 2015. All of that tells you that for consumers, this is a great time. You have very high confidence in terms of job security and in terms of cost of living. You see that in the jobs report which just came out last Friday. The overall job growth is about 2 percent for the U.S., but if you look at consumer-concentrated segments, like tourism and hospitality, those are growing at over 3 percent. If you look at construction employment, which is driven by the housing market, that is up about 4 percent year-over-year. Those are really the bright spots in terms of the U.S. economy. Looking at some of the prime home buying demographic groups, those 25 to 44 years old, the unemployment rate last year was 4.8 percent. This year, it’s down about 0.3 percentage points, so it’s about 4.5 percent. If you look at where we are in the business cycle, we’re probably in mid-cycle. Back in 2007, the unemployment rate for people in the prime home buying age group was about 4 percent. In 2000, that unemployment rate was under 4 percent. So I think there is definitely a long way to go in terms of improvement in unemployment rate, but I think we are in a very good spot. And the Fed is starting to raise rates, so that tells you that we are really in the middle of the cycle. In terms of housing, I think we are very positive on both demographics and also in a cyclical sense. In the demographics, we expect about 45 million coming into the 25 to 44 year-old-age group between now and 2020, and that’s going to be a big driver for the housing market. We really think the first-time home buyer segment and the baby boomer segment are the two drivers in terms of housing demand. What we are seeing in that group is very, very strong affordability, and I think that is going to be a big driver. We did an analysis just last month on overall affordability levels, and for first-time home buyers, since you are putting down less in terms of a down payment, you would expect your monthly payment to be higher. That’s an important point to keep in mind. Even for that group, we are looking at a monthly payment that is 24 percent of the buyer’s income and that’s below the 28 percent threshold for normal affordability. We did some analysis on that to see what would happen if interest rates were to rise and if home prices were to increase, because those are two trends that we truly expect to continue. What we found was that for affordability to go up to that level, we need home prices to increase another 10 percent and interest rates to increase another 100 basis points. In addition to that, we need to keep income constant. One of the trends we’ve been seeing in the last few years is that wage growth is picking up. Even though it is going very slowly, it is still going up. With income growth, we are going to see affordability normalize gradually, but we don’t have any concerns as far as affordability. As far as housing inventory, when we look at our volume, which is driven by first-time home buyers, we have seen very, very strong growth for the mortgage insurance industry as a whole. For example, if you look at 2015, the strongest year in terms of purchase volume since 2007, if you compare our first-time home buyer segment to what it was in 2009 and 2010, we’re up about four times. If you compare that to 2011 to 2014, we’re up about 50 percent. So we’re seeing tremendous growth as far as our first-time home buyer segment. I think that’s one of the reasons why housing inventory has come down. So the low inventory is an effect—it’s not really going to be the cause. That’s really going to keep the housing inventory level down, and that’s one of the reasons that we think home prices will continue to appreciate over the next few years. First-time home buyers are going to think about the same factors: Are home prices going to go up, what’s going to happen to income, what’s going to happen to interest rates. . .That should tell you that first-time home buyers want to come back into the housing market. I think the urgency is really building up in the housing market. Do you see the inventory issue improving at all this year? I think inventory will probably improve somewhat, but will improve slowly. I think on the new home sales side, one of the drivers is going to be a pick-up in single-family production. If you look at Zillow or any of the home selling sites and put in a filter for the last 10 years and you’re looking for newer vintage homes, what you’re going to see is that it’s much lower than the previous 10 years. That’s the result of very low production between 2007 and now. Home builders are definitely cutting back in terms of production, and that’s going to turn around. In the last few years, the increase in housing starts has been primarily driven by the multi-family housing sector, and I think that’s going to change in the next few years. In fact, just yesterday, there was a story about a disagreement within parties about volume vs. margin. In the last few years, there was a very big emphasis on margin among home builders. I think people are seeing the first-time home buyer segment opportunity and people are seeing the opportunity from increasing volume, and I think that’s going to change the home building industry’s strategy a little bit to focus more on affordability and focus a little bit more on volume. I don’t think we’ll go all the way back to the 2007 and 2006 levels, but I think the emphasis is going to change. The second driver for inventory to come back is higher prices causing homeowners to think about, “Do I want to stay in the home that I’m in, or now that I have more home equity, do I want to move to a better place where there’s better schools, closer to work, and better amenities?” I think having more home equity will allow many families to make that decision to move up much easier. So I think that’s the other reason that housing inventory will come back. If you look at the turnover rate in the housing market, I think we’re still below where we should be, taking into account home price appreciation and interest rates. So I think housing inventory is not going to be an impediment in terms of the housing recovery.